By providing your email address to Uluru Segway Tours you consent to receiving emails from Uluru Segway Tours in regards to the confirmation, update or any other information relevant to your booking or tour experience. In addition by providing your email address to Uluru Segway Tours you also consent to receiving emails about Uluru Segway Tours via third party Tripadvisor. It is requirement of participants to arrive 10 minutes prior to their tour’s scheduled departure time. At it’s discretion Uluru Segway Tours may refuse participation of late arrivals, without a refund. Our cancellation policy is 24 hours. You are free to amend or cancel with no charge if we have been given more than 24 hours notice. If you cancel or alter your tour within 24 hours of the confirmed tour time no refund will be provided. Refunds will not be provided to passengers who are “no-shows”. Extenuating circumstances requiring tour refunds will be assessed on a case-by-case basis. Refunds will not be issued once the Segway training has commenced, unless an Uluru Segway Tours guide deems any participant to be incapable of riding a Segway Personal Transporter, then in such a case a refund may be granted. Gift certificates are not transferable for cash, however bookings made using a gift certificate can be rescheduled. 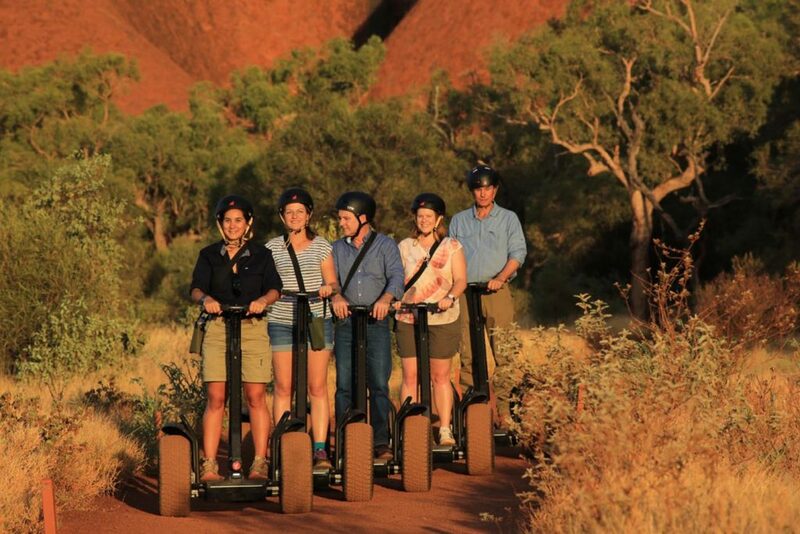 Uluru Segway Tours reserves the right to cancel or alter tours or activities where necessary due to; operational restrictions, weather conditions, mechanical defects or any other changes to operational conditions. In such instances participants will be either – offered an alternative activity, rescheduled to a suitable time or issued a refund. Other than this participants will have no claim to any additional compensation relating to the cancellation of the activity. Participants are required to wear closed in shoes whilst participating on any Uluru Segway tour activity. Under no circumstances will participants wearing thongs be permitted to engage in any Uluru Segway Tours activity. People with serious health problems/back injuries or who are pregnant should not participate in any Segway activities. It is the riders responsibility to ensure that they have read and understand all of the above rider requirements. Whilst every reasonable precaution will be taken to prevent accident and injury Uluru Segway Tours will not be responsible for any accident or injury, damage or loss and this condition of contract may be pleaded by the operator and owner as a bar to any action proceeding for breech of contract, negligence or any other liability sustained such as injury damage or loss. All participants are required to sign the waiver release and indemnity form prior to engaging in any activities offered by Uluru Segway Tours. The form includes but is not limited to the statements that the participant has read and through signing the form accepts their obligations and engages in the activity at their own risk. Participants under the age of 18 years will require their parent/guardian to sign the forms on their behalf. Uluru Segway Tours reserves the right to prohibit any participant prior to the start of the tour, during the training session or tour itself from participating in the activity if the participant fails to meet the rider requirements. Additionally participants may be removed from the activity if they do not follow directions or instructions issued to them by Uluru Segway Tours staff; in these instances no refund will be given. Uluru Segway tours does not accept responsibility for loss or damage of any personal items stored at the site or carried on the participant or Segway PT during Segway activities.